Finding the old and out with the new. When we first set eyes on our late Victorian property it was love at first sight. On viewing the house our love grew whereas it would of sent many running to the nearest new build development. Restoring a house is not to be taken lightly, and you should always invest in the top survey before you buy, this could save you thousands in the future and help you decide on how bigger project you would like to take on. For us it was cosmetic and mild restoration we were after. I didn't want a house that was falling down, needed extending or re-wiring. 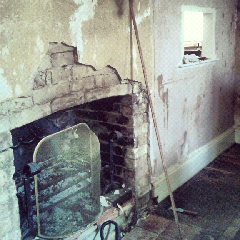 But stripping out the new to find the old was definatley something we wanted to do. Putting back our beautiful home to its rightful roots. When taking on this sort of project, work out how long you can see yourself living there, then think of what matters the most.. priorities, for us we had no kitchen, so before we could even move in, this had to be done and we worked this into the budget when buying the house. we had decided we wanted to live in the house for roughly the next 20 years while the kids were growing up. This gives us the time to restore our house ourselves as much as possible. Set yourself priorities and goals such as by this Christmas we will have the living room finished. Don't expect to have it all done at once unless you have a huge or endless budget. Always finish one room before starting another... this will mean you don't live in total chaos and have other rooms to go to for a retreat. If your a dab hand at diy then great, just be careful. Always get a professional in for electrics and gas!